The Oklahoma City Thunder finally got to sleep consecutive days in their own beds and will enjoy the confines of their abode from now until the All-Star break, sans one trip to Houston. This will be the second of 3 meetings between the two teams this season. The Thunder’s last game was against these Jazz, while for the Jazz, this will be their 3rd game in as many nights. The Thunder won the last meeting going away 101 – 87. The Utah Jazz have the definition of consistently inconsistent. They started off the season losing 3 of their first 4. Then the reeled off 9 wins out of their next 11 games. And now they’ve lost 6 of their last 10 games. They currently sit at 14-13, good for 4th in the division and 9th in the conference. The Jazz are led by their front court of Al Jefferson and Paul Millsap. Together they are averaging 35 points and 18.6 rebounds per game. Though a bit undersized, they are one of the more formidable front courts in the league. Last season’s first round pick, Gordon Hayward, is rounding into a good role player providing more scoring, rebounding, and playmaking as the starting SF. The backcourt of Devin Harris and Raja Bell is veteran-laden, but a bit limited in all facets of the game. The bench for the Jazz can be inconsistent, with veterans CJ Miles, Josh Howard, and Earl Watson getting the bulk of the bench minutes. The Jazz’s defense is pretty suspect as they allow 97.2 points per game, which is 23rd best in the league. 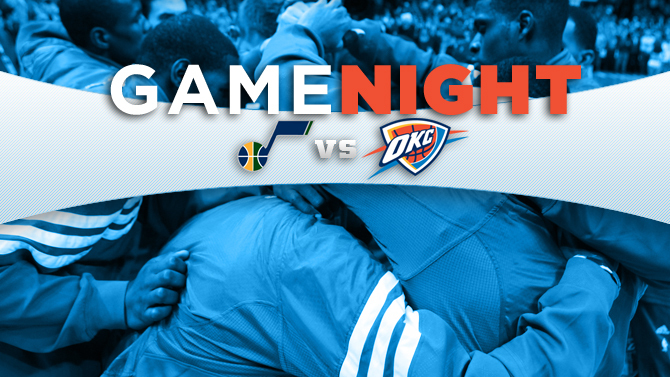 This will be the 3rd game in as many nights for the Jazz, while the Thunder haven’t laced them up since last Friday. 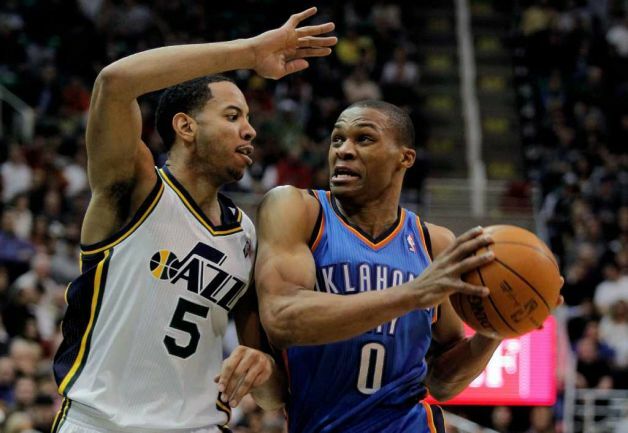 When the Utah Jazz chose their poison in the last game and decided to focus all their defensive attention on Kevin Durant, it freed up Westbrook to take advantage of the smaller Harris and score 28 points on 10/20 shooting from the field. It will be very interesting to see how the Jazz choose to defend Westbrook this time around and how Westbrook adjusts to this. Turnovers. Please gentlemen, let’s keep these turnovers to a minimum. I don’t know a good number, but the more you turn it over, the more you give the other team opportunities to score on their end. Everyone on the court is an NBA player, and eventually, if given enough opportunities, even bad teams will score on their increased opportunities. Interior defense. Millsap and Jefferson are very similar to Marc Gasol and Zach Randolph in that they aren’t overly athletic, but are very fundamentally sound and have good mid range games. For being undersized, Millsap is deceptively good on the interior. It’ll be very important that Ibaka, Perkins, Mohammed, and Collison stay with these guys at all times, as they have been know to drop 30 and 15 type games. Offensive schema. There is no one on the Jazz that can consistently guard Kevin Durant or Russell Westbrook. Durant is so much bigger than Bell,Hayward, or Howard. And Westbrook is so much stronger than Harris and quicker than Watson. The key will be the shooters (Cook, Sefolosha, and Harden). If they are making their shots, the defense won’t be allowed to collapse on Durant and Westbrook, as their primary defenders will need help throughout the game.